Over the past 6 months, I have been working and volunteering at an American NGO known as the Red Sweater Project. The aim of the Red Sweater Project is to offer affordable education to rural Tanzanian youth who can't afford public schools. In Tanzania, although school at this point in time is essentially "free", things such as books, uniforms, boarding (most secondary schools are boarding schools), stationary, and other necessities are not and thus can make education unappealing, unaffordable, or impossible for many students. In rural communities, children are treated as farmhands or the housekeepers and girls are often married young because its a culture that still receives valuable dowries for their female offspring. Girls can legally get married at 15 but in rural communities, child brides as young as 10 are still seen (something that I personally witnessed while living there). As for males, especially among the Maasai, children, from as young as 4, are in charge of the grazing their family's cattle. Males often must wait until a younger male child is born into the family before they can start primary school. So yes, that means seeing 14 year olds in elementary school isn't all that weird in this society. Because of that, we had students aged between 13 - 23 in the four grades we offer. The aim of our school is to prevent girls from getting married young, keep students living with theirfamilies with a day school environment (very rare these days in TZ), allow youth to bring their education back into their communities (e.g; simple first aid, creating fertile soil, the English language), and just simply offering a quality education to students who come from families that can't afford it. An added bonus is that our particular town, Mto Wa Mbu, prides itself in representing all 120 tribes in Tanzania which means that our school as educates students in an incredibly diverse environment. I probably should explain the general setup of Tanzanian schools before I go into anymore depth about our program itself. Because Tanzania is a former British colony, its educational system is based on the UK system. Primary school is from Standard (grade) 1 - Standard 7, secondary school (or Ordinary levels) is from form 1 - form 4, and high school (or A levels) is from form 5 - form 6. I can't really describe any grades/forms by ages because there was such an age gap in each grade as mentioned above. Public school teachers get assigned to schools randomly when they become certified but its not uncommon to hear that they have second jobs and rarely show up to teach in both the primary and secondary school level. This leaves a huge portion of students that are unprepared for their leaving exams and often failing and falling through the cracks in the system. Additionally, class sizes can be as large as 80 students, many sharing chairs and desks. Prior to starting secondary school, students must take intensive English classes, also known as Pre-Form, in order to succeed in higher education. Without English, students cannot comprehend their studies because all subjects are taught in English except for their native tongue, Swahili. Students coming from local public schools have learned such little English from an ineffective system that they're very far behind and in desperate need of decent, intensive English lessons - something that our foreign volunteers provide to our students. At our school, Mungere Secondary School, the largest class has 29 students and the smallest has 24. Through the four grades, we currently have 101 students. The students study English, Swahili, History, Geography, Civics, Agriculture, Physics, Biology, Mathematics, and Chemistry, the classes are 80 minutes in length, and all subjects are between two and three times a week. The English department (and sometimes the Math department depending on volunteers) is run solely by foreign qualified teachers on a semester basis and all other teachers are Tanzanian. Unfortunately, the Tanzanian curriculum requires ridiculous standardized testing which determines the future of the students at a young age. Teaching to the test is a setback and challenge for teachers in Tanzania but because it is mandatory, one must adapt and accept the government's decisions. Both form 2 and form 4 are required to take 2-3 hour tests in every subject at the end of the aforementioned school grades and when it comes to form 4, if one does not successfully pass, his or her school career is finished then and there. In public schools, they'll send a student back to form 2 if he or she wishes to repeat and try again but because many students are already in their 20s when this happens, students are less inclined to continue and would rather start their lives. 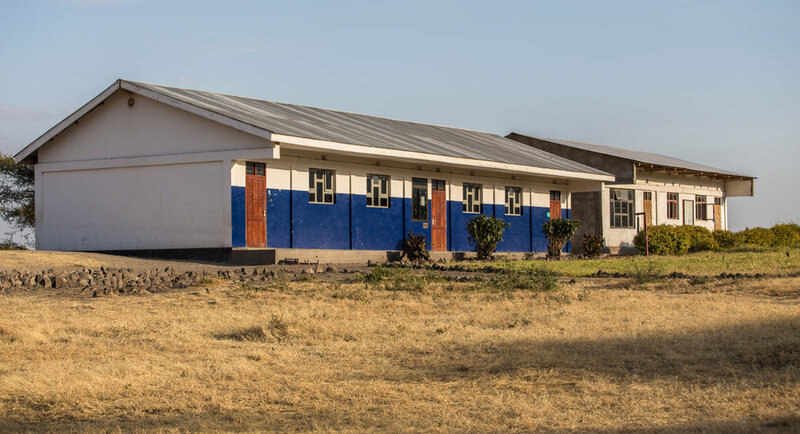 Thus, Tanzania has a very very low high school graduation rate and this project providing a stable school is all the more important. The founder and director of the project carefully selects prospective students through thorough interviews and home visits prior to admitting them into our school. This is to ensure that the students who are entered into our school are actually from our community and not just trying to take advantage of the system because it costs very little in school fees. Space is limited and there are many more applicants than there is space for unfortunately. The school runs solely on American sponsors and company partnerships and the director spends a large portion of her year finding sponsors for our children to keep the project running. Through her hard work and diligence, a science lab has been funded through a large US company and we hope to have our four new classrooms and well as form 5 and 6 running by June. Because our students live rurally, the students without bicycles have to walk many kilometers to and from school. Probably 90% of our students live without electricity and use small solar lights as lighting after dark. Our students want to come to school to be educated. They understand the value of education and know that they have an invaluable opportunity once accepted into our school. This made my volunteer position extremely rewarding. You don't need silly techniques like you need with Korean children to get their attention when you start class because they understand it is time to be quiet. They spend hours studying in and out of school and the level of English difference between form 1 and form 3/4 is immeasurable. The best part of the school is that the students essentially made the school into what it is today. They built the gardens, designed the fields, cleaned the grounds, removed trees, and all of it was so they had a place to study. These students deserve the best education because they actually want to be educated and have a thirst for knowledge. It's hard to look back at my upbringing as well as my former experience working in South Korea and realize how wonderful we have it. Education is handed to you on a silver platter and is absolutely taken for granted by most students. Having a pencil, pen, or a notebook to write in is so disposable in the west and the same simple things are wonderful birthday or graduation presents in Tanzania. Having a cafeteria is a dream for our Tanzanian students but expected in the west. I had the pleasure of being a full-time teacher where I was teaching English to form 1, form 2, and form 3. With both my form 1s and 2s, I was teaching proper ESL and with form 3, I was teaching creative writing. This allowed me to learn about my students and expand their personal stories as well as delve into a completely different culture. I could see simple things as how my students perceived beauty or more difficult topics such as HIV in the community. Here and here are two examples of essays written by our form 3 students during my class. Additionally, with ESL, I was able to see patterns of difficulties for Swahili speakers and discuss cultural and social opinions in Tanzania. Social subjects are rarely taboo and topics of corruption, drug and alcohol abuse, prostitution, and HIV are regularly taught either through English literature and reading comprehension and also through different subjects. I also learned how to adapt. If you don't have an unlimited access to printing handouts and a book for every student, you learn different teaching methods to suit your students. With adaptation, one can easily discover that all you really need is willing students to educate. This is just an introduction to our school. My subsequent posts will be about our community and will feature two of our students that allowed me to visits to their homes. Glancing into their every day lives allowed me to see the struggles students face outside of their schools as well as a completely different world. These students have taught me a lot about the world even though few of them have ever left their home villages. At least 5.9 billion people live in the developing world which is hard to imagine in our developed comfort zones. Needing a mosquito net at night to prevent malaria isn't a concern of ours nor is running our own farms to ensure we have food at night. The Mungere student's thirst for knowledge and dedication to their studies is absolutely inspiring and I hope my following stories will be an inspiration to others to either volunteer themselves, donate simple items or books, or just educate themselves about the different corners of the world and maybe inspire for people to experience it firsthand.